Pre-dreadnought Kurfürst Friedrich Wilhelm at Helgoland, Germany. 28 cm/40 guns are in bow and stern mountings. Midships turret carried 28 cm/35 guns. Detroit Publishing Company Collection Photograph. Library of Congress Photograph ID LC-DIG-ppmsca-00589. Pre-dreadnought Weissenberg. Note that the name is mis-spelled on the photograph. IWM photograph Q 41287. 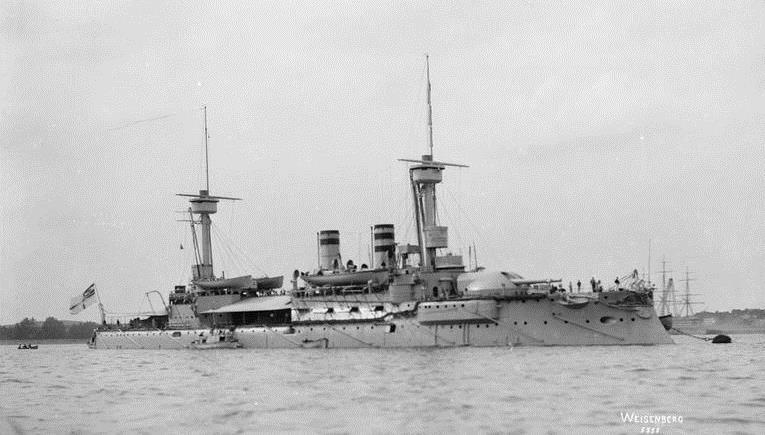 Used on pre-dreadnoughts of the Kurfürst Friedrich Wilhelm class. The mixture of both L/35 and L/40 guns on these ships shows how centralized fire control was not yet available for these ships, even though they had a "uniform" main battery. These guns were built from hoops and used a horizontal wedge breech mechanism. These mountings used hydraulic power with steam pumps as prime movers. The breech mechanisms were hand-worked as was the ramming. ^The AP L/2,6 was about 2crh. For a sketch of the AP L/2,6, please see the 28 cm SK L/40 datapage. ^As originally introduced, these guns used brown powder. "Die Geschichte der deutschen Schiffsartillerie" says that the effective range of this gun when introduced was 12,030 yards (11,000 m). Data from "Die Geschichte der deutschen Schiffsartillerie." ^C/92 turret needed to train to 0 degrees in order to load.